In the lakeside town of Shelburne, VT, there’s an old aircraft hanger stuffed with vintage Land Rovers awaiting restoration. It’s the home of Colby Morris, owner of Tin Shack Restoration and a lifestyle that turns us green with envy. 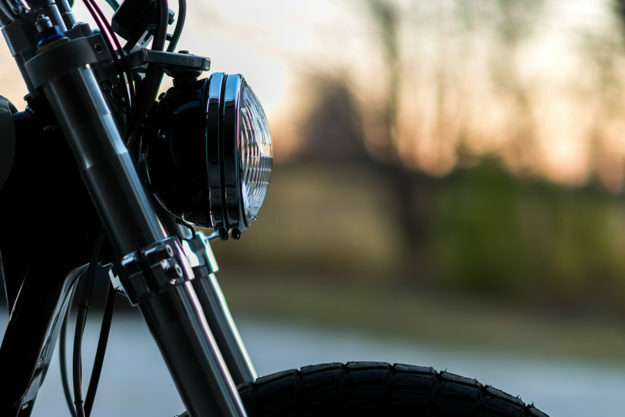 When he’s not sprucing up old Landies, Colby likes to wrench on motorcycles. 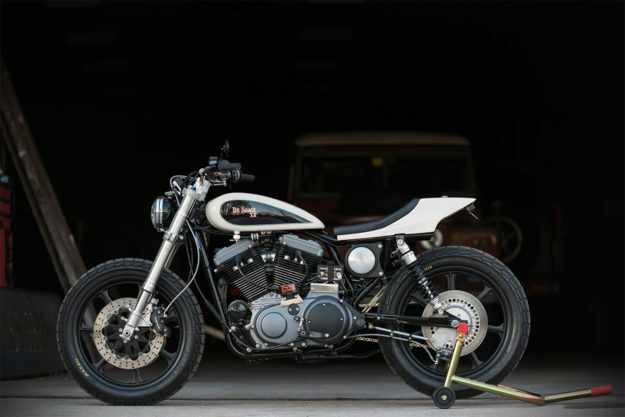 This is his latest ‘in between’ project—a Harley Sportster XL1200 given the street tracker treatment. 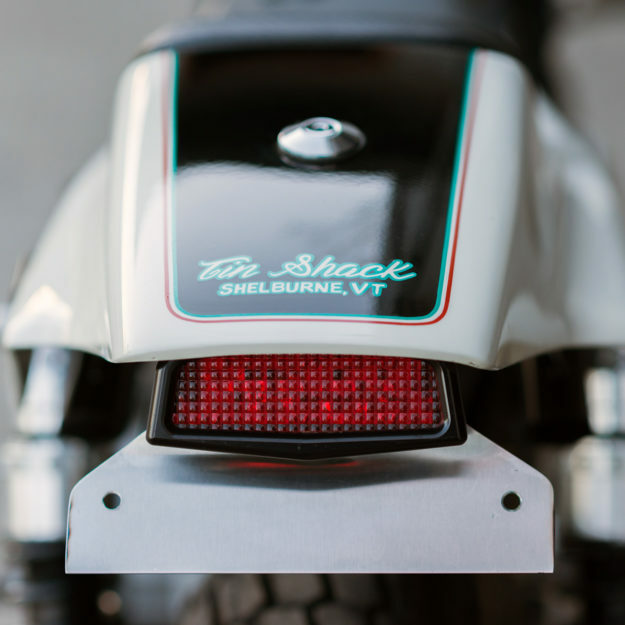 “I’d been looking for an old Triumph to turn into a bobber,” Colby tells us. “Similar to what Atom Bomb or The Factory Metal Works might build. 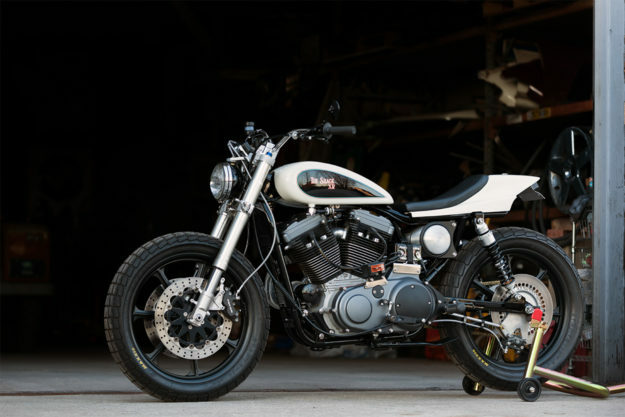 Then Colby started to notice good condition Sportsters for sale, for what he calls “really short money.” When 1998 model was traded in to Colby’s local Ducati dealer, he pounced. 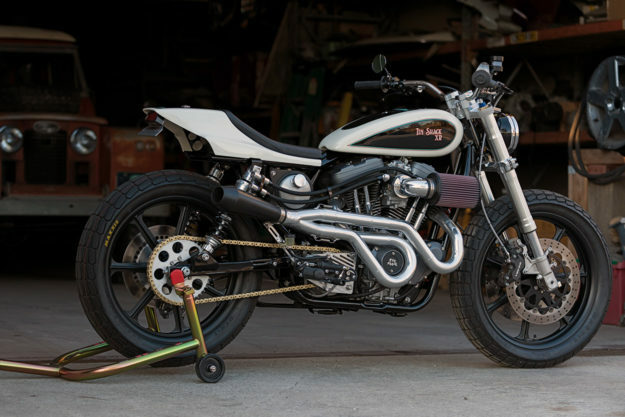 The Sportster was in great shape; with only 8,400 miles on the clock, the Evolution engine was barely run in. So Colby has given it a power boost, installing a Mikuni HSR 42 carb that improves output by 12 horses alone. A solid spark comes from a Dyna 2000 ignition module, a Dyna Twin Fire coil and Sumax ThunderVolt plug wires. 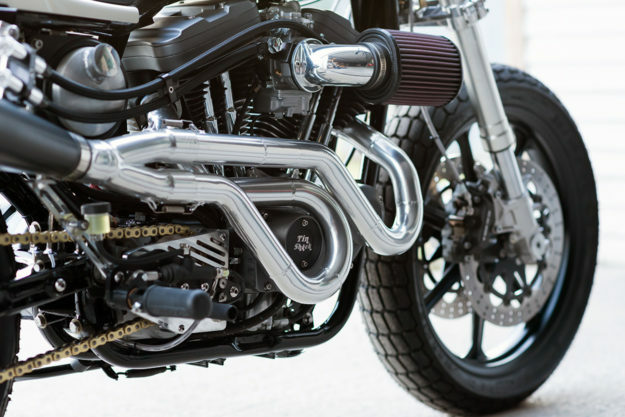 Gases exit via serpentine exhaust pipework that Colby fabricated himself, with a ceramic coating to keep heat in. The engine looks spectacular, but it’s the front end that got the heaviest reworking. 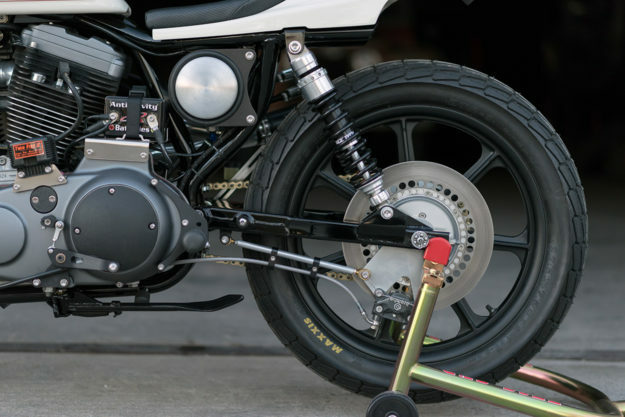 Colby has grafted on the forks from a Suzuki GSX-R750, supplied by Mule, and firmly attached with a ‘gull winged’ top triple built by Tri-Angle Metal Fab. 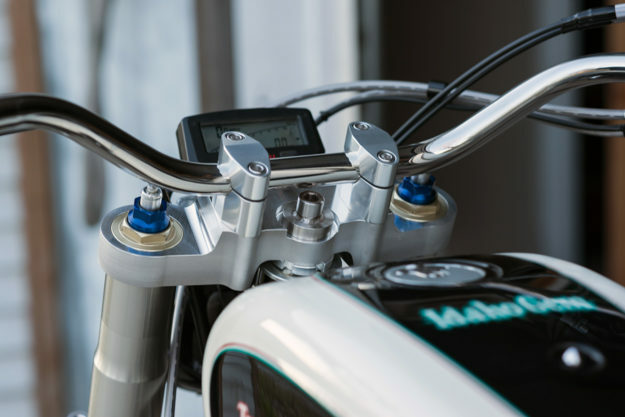 Mule supplied a set of polished stainless bars with a street tracker bend, and the headlight and mounting system are a joint Mule/Joker Machine production. The wheels are 19 inches, both widened by Kosman Specialties and perfect for the tracker stance. The front wheel is from a Kawasaki KZ400, and the back wheel is from a late 70s Harley XLCR. Mule provided bearing carriers, spacers, and rotors to help get the right fit, and the tires are Maxxis’ iconic DTR-1 dirt track hoops. Chainsikle supplied the rearsets. To get dynamic (and visual) symmetry, Colby has moved the rear shock mounts forward three inches, and installed a custom set of G3s provided by Race Tech Suspension. 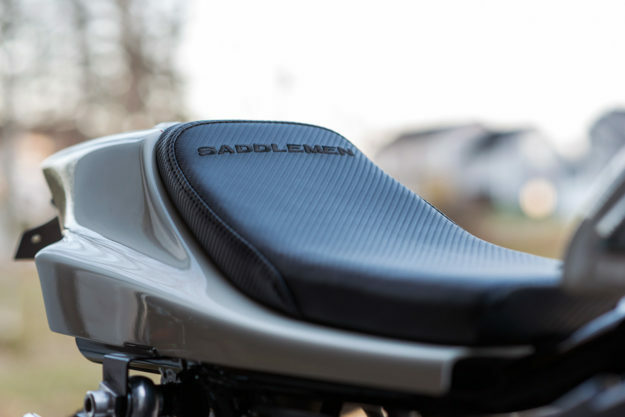 The rider sits on a Saddlemen seat pad that looks just like something you’d see on a factory bike, and there’s a substantial three-quart oil tank from Mooneyes right underneath. After fabricating and fitting all the little details like brackets, mounts, trays and inner fenders, Colby sent the bodywork off for paint. Autobahn Body Works applied a simple monochrome scheme using Mini’s ‘Pepper White’ and a BMW jet black. The only flash of color on the bike is the gold chain that replaces the belt drive, and hand lettering by Charlie Decker of Bandit Pinstriping. 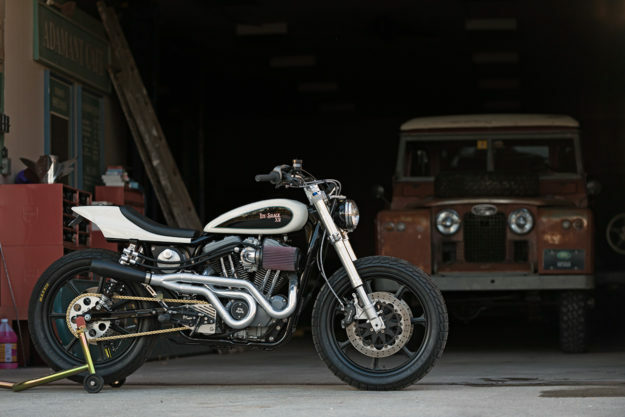 That’s exactly what he’s ended up with—and one of the most impressive Harley street trackers we’ve ever seen. We’re betting that even folks who normally steer clear of Milwaukee metal would love this in the garage. 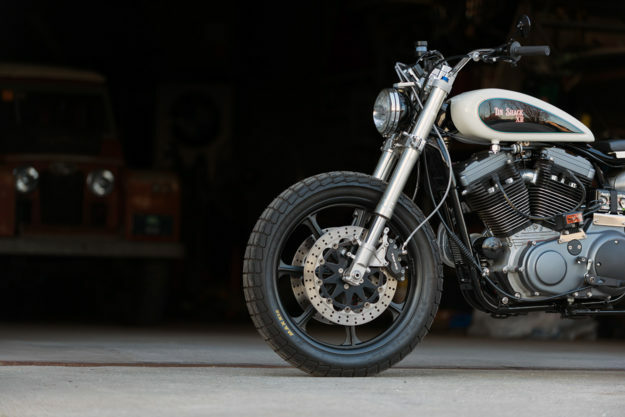 Double Trouble: Two new CB750 builds From Hookie Co.